FInally, a Whiplash competition I really want to try and that I actually had time for! This time it is a miniature quilt theme and that's right up my alley now. I started this project the day after the announcement of the theme and had it done in about a week. I had to wait a couple of days to get the binding on because my machine went in the shop to fix the bobbin winder. Some sneak peek photos can be found here. I really loved working on this project. From the start I wanted to do something totally spontaneous. 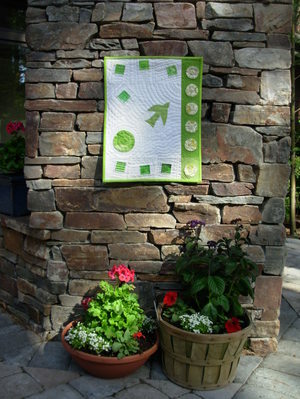 It started with the pieced squares which are inspired by Gwen Marston's Liberated Quiltmaking. 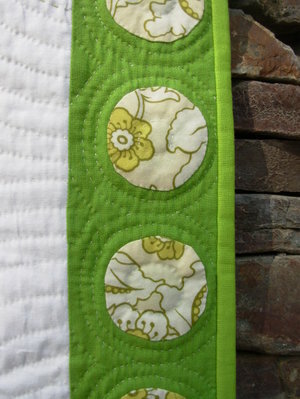 Then I really wanted the appliqued circles too, so I added the one at the left. The bird came next because I'm experimenting with bird images in all the art I'm doing lately. Finally, I ran out of the white fabric, so I added the green strip up the right side. The appliqued circles there were just because I wanted to do more circles! The fabric for those is a new one in the stash. It didn't seem to fit right on the light side of the quilt because it's was too yellow, but it worked just right on the green. 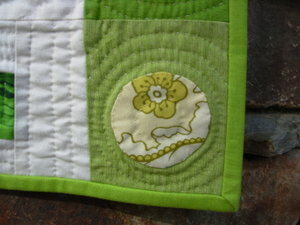 This little quilt provided the perfect opportunity to play with the hand quilting as well. I hand quilted this without marking at all. I find that I really love this way of quilting. Each section was done a little differently. I also added the embroidery stitches in green for a little more color. 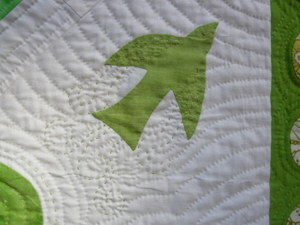 Just in the past couple of days I discovered this great article about free hand quilting by Joe Cunningham. I also have a book that Joe did with Gwen Marston called Quilting with Style and they talk about quilting without marking there as well. This is a beautiful book that is well worth the price if you are a hand quilter. There is also a great tutorial on free hand fans here. 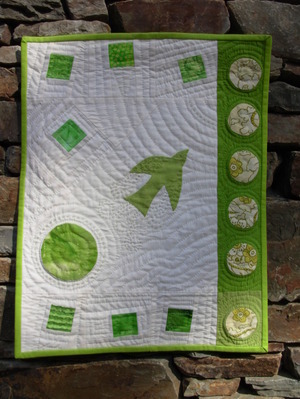 I call this quilt, "Think Green". It's 15" x 19", machine pieced, hand appliqued, hand quilted. I used Quilter's Dream Request which is their thinnest loft 100% cotton batting.